Strum some sweet songs with the ukulele you built yourself! The My Ukulele Kit is a wonderful do-it-yourself project. The ukulele's small size makes it a great instrument for kids and the relatively small number of parts ensures a frustration-free building experience. Did we also mention that everything sounds so darned chill and relaxed on a ukulele? You adults are going to love having this guy around. You can keep your uke next to the couch and strum away without even having to sit up. It's so addictive — especially with the bond created by having built it yourself. 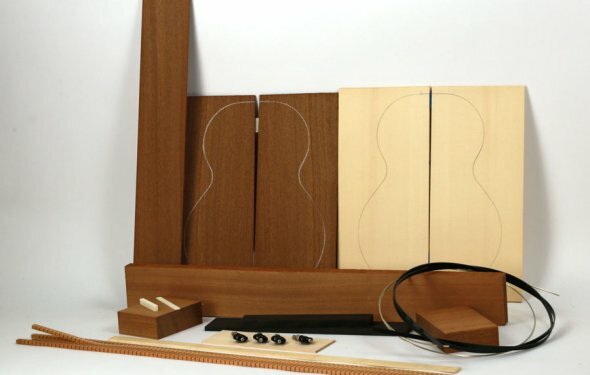 All of the components necessary to build your own ukulele are included in the kit. Check out the video below to hear the uke you're going to build. Sadly, building a ukulele did not fix Jamie's tone deafness. Please note that the style of the ukulele has changed slightly since this demonstration was made. The My Ukulele Kit is made from unfinished wood. You can paint it, stain it, adorn it with stickers, embellish it with drawings (perhaps of the Vat19 logo? ), or simply leave it "au naturale". The point is to have fun. So get started and buy, buy, buy! The Build Your Own Ukulele Kit allows you to design the type of Uke you want. Answer: It really isn't too difficult. Including drying time (for gluing the neck to the body), it should only take about 3 hours total. Please note: The neck fits very snugly into the body and may require a bit of sanding or shaving to fit. Answer: In addition to wood glue, you'll need a Phillips screwdriver and a drill for creating pilot holes to attach the bridge to the body. You may also need a clamp to hold the neck to the body while your wood glue dries. Answer: The instructions do include one song, but we think you'll be better off hitting up YouTube. There are many channels devoted to teaching you how to play the ukulele. Answer: Because building stuff is fun! Being able to personalize the design of your uke along with simply knowing that you put it together makes it special. Roy Hobbs could have used any ol' baseball bat. But carving one himself from a tree struck by lightning? That's how you knock the cover off the ball.